An organization to be successful needs to evaluate its performance in a consistent manner. In order to do so, the organization is to set standards for itself, and measure its processes and performance against recognized leaders in the field or against best practices from other fields, which operate in a similar environment. This process is normally known as benchmarking in management parlance. The objective of benchmarking is to find examples of superior performance and to understand the processes and practices driving that performance. Organization then improves its performance by tailoring and incorporating these best practices into its own operations—not by imitating, but by innovating. Performances which are normally measured are quality, time and cost. During the benchmarking exercise the organization learns the new processes which are superior to the processes being presently followed by them. By implementing these new processes the organization improves its performance. Organizations use benchmarking technique for the following objectives. The benchmarking process is relatively uncomplicated. Some knowledge and a practical dent is all that is needed to make such a process, a success. Further benchmarking should not be considered as one time exercise. To be effective, it must a continuous process and should become an integral part of an ongoing improvement process with the goal of keeping abreast of ever improving best practice. Benchmarking process can be an internal process (comparing performance between different groups or teams within the organization) or an external process (comparing performance with other organizations working in similar environment). Internal benchmarking – During the internal benchmarking the main advantage is that access to sensitive data and information is easier; standardised data is often readily available; and, usually less time and resources are needed. There may be fewer barriers to implementation as practices are relatively easy to transfer across the same organization. However, real innovation is lacking and best in class performance is more likely to be found only through external benchmarking. External benchmarking – It involves analyzing outside organizations that are known to be best in class. External benchmarking provides opportunities of learning from those who are having the “leading edge”. This type of benchmarking can take up significant time and resource to ensure the comparability of data and information, the credibility of the findings and the development of sound recommendations. The benchmarking process can be of many types. These are given below. Strategic benchmarking – This benchmarking is practiced when the organization need to improve overall performance by examining the long term strategies and general approaches that have enabled high performers to succeed. It involves considering high level aspects such as core competencies and improving capabilities for dealing with changes in the external environment. Changes resulting from this type of benchmarking are difficult to implement and take a long time to materialize. Process benchmarking – In process benchmarking the organization focuses its observation and investigation of critical processes and operations with a goal of identifying and observing the best practices from one or more benchmark organizations. Process benchmarking invariably involves producing process maps to facilitate comparison and analysis. Activity analysis is done where the objective is to benchmark cost and efficiency. This type of benchmarking is applied to back office processes and results into short term benefits. Performance benchmarking – This is also known as competitive benchmarking. In this type of benchmarking the organization consider its position in relation to the performance characteristics of key products and services of the target organization. Benchmarking partners are drawn from the same sector. This type of analysis is often undertaken through trade associations or third parties to protect confidentiality. Functional benchmarking – In this type of benchmarking the organization look to benchmark with benchmarking organizations drawn from different sectors or areas of activity to find ways of improving similar functions or work processes. This sort of benchmarking can lead to innovation and dramatic improvements. Normally in this type of benchmarking the organization focuses its benchmarking on a single function to improve the operation of that particular function. Complex functions are unlikely to be directly comparable in cost and efficiency terms and may need to be disaggregated into processes to make valid comparison. Product benchmarking – This type of benchmarking involves the process of designing new products or upgrading the current ones. This process can sometimes involve reverse engineering which is taking apart the product of the benchmark organization for finding the strengths and weaknesses. Benchmarking methodology needs a step by step approach. These steps are given below. Planning – It is imperative that the organization identifies the activities that need to be benchmarked prior to engaging in benchmarking. Since benchmarking can be applied to any business process or function, a range of research techniques may be required. These include informal conversations with customers, employees or suppliers. These also include exploratory research techniques, re-engineering analysis, process mapping, quality control variance reports, financial ratio analysis, or simply reviewing cycle times or other performance indicators. Before embarking on comparison with other organizations it is essential to know the organization’s function and processes; base lining performance provides a point against which improvement effort can be measured. The next step in the planning process would be for the organization to choose an appropriate benchmark against which their performance can be measured. The benchmark organization can be a single entity or a collective group of organizations, which operate at optimal efficiency. If such these organizations operate in a similar environment or if they adopt a comparable strategic approach to reach their goals, its relevance would be greater. Collection of information – Information need to be collected can be the primary data and secondary data. Primary data refers to collection of data directly from the benchmarked organization/organizations itself, while secondary data refers to information generated from the media, publications or internet. Exploratory research, market research, quantitative research, informal conversations, interviews and questionnaires are some of the most popular methods of collecting information. When engaging in primary research, the organization needs to redefine its data collection methodology. Drafting a questionnaire or a standardized interview format, carrying out primary research via the telephone, e-mail or in face-to-face interviews, making on-site observations; and documenting such data in a systematic manner is vital, if the benchmarking process is to be a success. Analysis of data – Once sufficient data is collected, the proper analysis of such information is of foremost importance. Data analysis, data presentation, results projection, classifying the performance gaps in processes and identifying the root cause that leads to the creation of such gaps are then require to be then carried out. 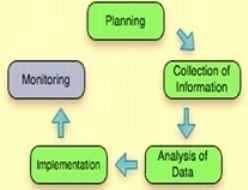 Implementation – This is the stage in the benchmarking process, where it becomes mandatory to walk the talk for success. This usually means that far reaching changes need to be made so that the performance gap between the target and the actual is narrowed and eliminated. A formal action plan, that promotes change, is to be formulated keeping the culture of the organization in mind so that the resistance that normally accompanies change is minimized. The commitment of management and staff is to be fully ensured for the process and sufficient resources are to be there to meet the cost of facilitating the necessary improvements. Monitoring – Benchmarking process need to be properly monitored in order to reap the maximum benefit out of the benchmarking process. A systematic evaluation is required to be carried out on a regular basis. Assimilating the needed information, evaluating the progress made, reiterating the impact of the changes and making any necessary adjustments, are all part of the monitoring process.